You must make reservations at least 5 minutes in advance of the time at Der Fondue Chessel. Check in at the River Run Gondola exit lane and board. Exit the River Run Gondola and walk across the summit to board the Outpost Gondola Enjoy a 20 minute ride to North Peak. Our strolling musicians will keep your toes tapping to their traditional Bavarian songs and don"t be surprised if you find yourself doing the Chicken Dance at 11,444'. Der Fondue Chessel is a fondue lover’s dream, whether it's a cozy dinner for two or a fun group gathering. 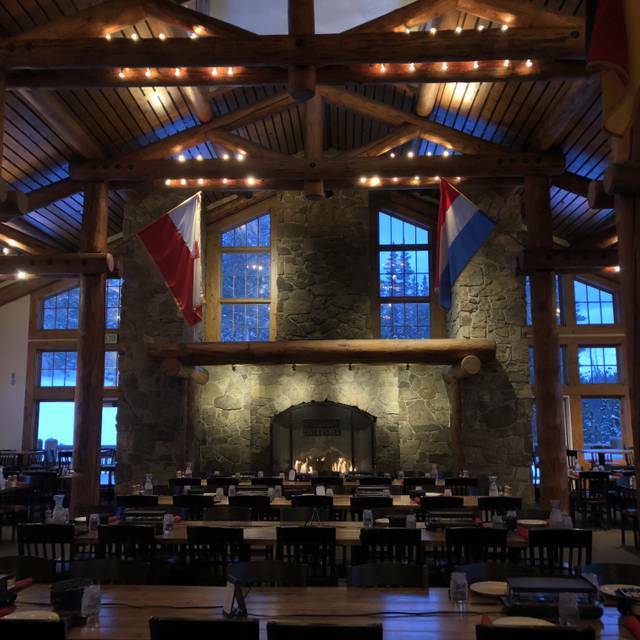 Enjoy authentic a fondue experience atop Keystone's North Peak Mountain. It is a very cozy atmosphere with an element of adventure as you arrive by gondola. Whilst we enjoyed ourselves we all felt that for what we got the price was exorbitant. The amuse bouche of raclette cheese with a couple of little potatoes and veggies was delicious and frankly we’d have liked the option of more. As far as authenticity, the cheese fondue didn’t have kirsch in it and was served with white bread, brown bread, mini pretzels and veggies. For four people there wasn’t enough. For the main course we had the chicken broth option which came with three cubes of steak, three shrimp and three cubes of chicken. 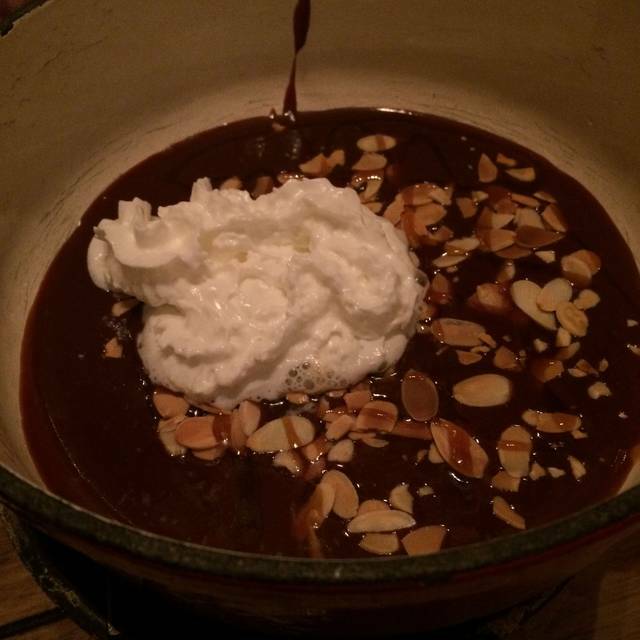 The third course was chocolate fondue which our friends ate but we didn’t want. 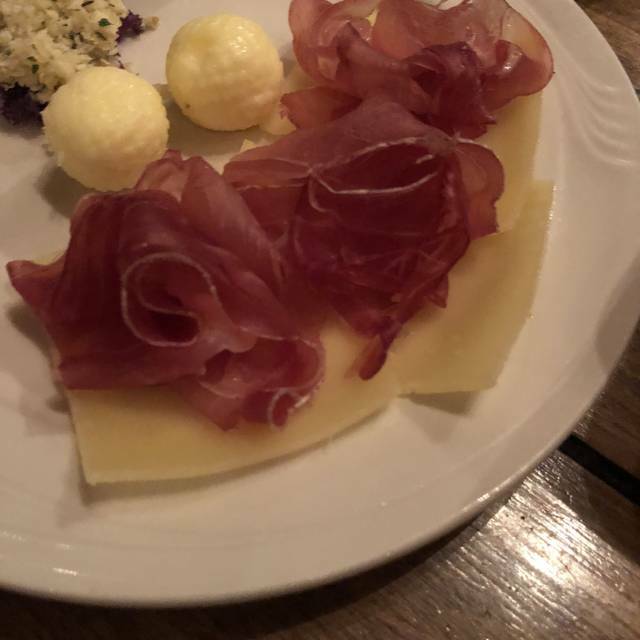 We requested more cheese and it was brought. The whole meal was $300-400 for two people. Having experienced the real thing in France and Switzerland for a fraction of the cost, I feel if you’re going to charge those prices then your product better be bloody good and honestly it isn’t! Did enjoy the live entertainment though. We eat here every year during our spring break. We were very disappointed with the change in pricing/value this year. Provide has gone up and there was way less food, especially the meat. Definitely not $80 worth of food. I know you’re paying for the whole experience and not just the food, but the tiny plate of meat was unacceptable. Sadly, we won’t be returning next year! It was an incredible esperience. We loved the ambience. Stuff was prompt and friendly. The food was ok, but not worth the price. You are definitely paying for the experience. Too expensive for having to cook your own supper. Waste of money. Can think of a LOT of things I’d rather spend $400.00 on. Disappointment. Really high priced fondue dinner that was average at best. Buyer beware. We had alerted the staff in advance that we were celebrating an engagement that happened just before coming into the restaurant. It was supposed to have been a romantic night for us. No blanket for the ride up or the ride down. Polka music played that was too loud and annoying. Kids running around screaming-crying. Shared tables that remind you of going into a cafeteria. Food very bland. Had to ask for spices. Would not recommend unless you just want to drop $300 for a ok evening. We've been visiting Der Fondue Chessel at least once annually, often more, for over 20 years. We could not have been more disappointed to learn the table top raclette grill was replaced by cooking in broth over an induction cooktop. The explanation was the liability issue with children. After all this time? Not buying that. The unique experience has been ruined. We can go to the Melting Pot anywhere. The choice of salads was an improvement over Ceaser only. Portion was decent. Cheese fondue was an extremely small portion but tasty. Ran out of cheese well before we had dipped about half of the dipping items. Protein portions were ridiculously small. Literally a couple of cubes of lobster and meat offerings. Way overpriced for what was provided. The chocolate fondue was good but once again small leaving much left on the plate of dippers. Always enjoy the musicians and seeing Angie and her group. Unfortunately we have crossed Der Fondue Chessel off our list unless the old cooking format is restored. I suppose we should have looked more closely on the website to learn of the change. 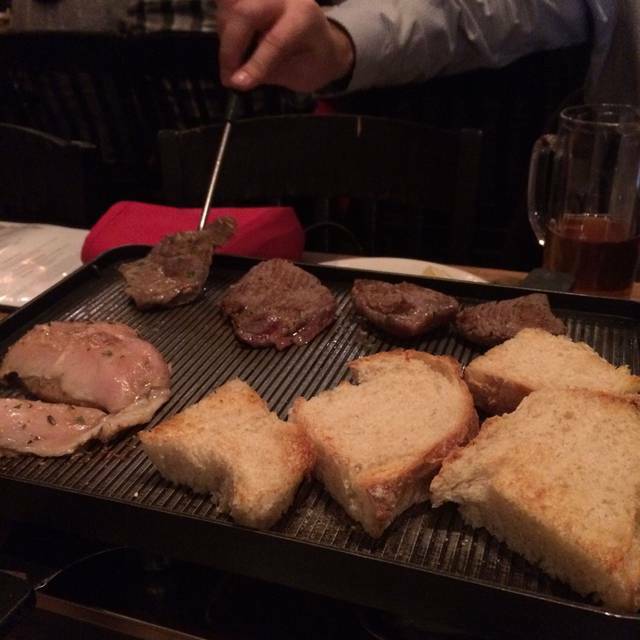 However, the pictures online and in the Keystone magazine still show a raclette grill. Bad form. As local property owners we'll patronize the other Keystone offerings. Way over priced for the experience. And having to pay $35 each for our two and four year old was ridiculous. We felt the overall experience could be outstanding, however we will not return or recommend. The food quality was average at best and was way overpriced. I had pictured a quaint and cozy atmosphere. 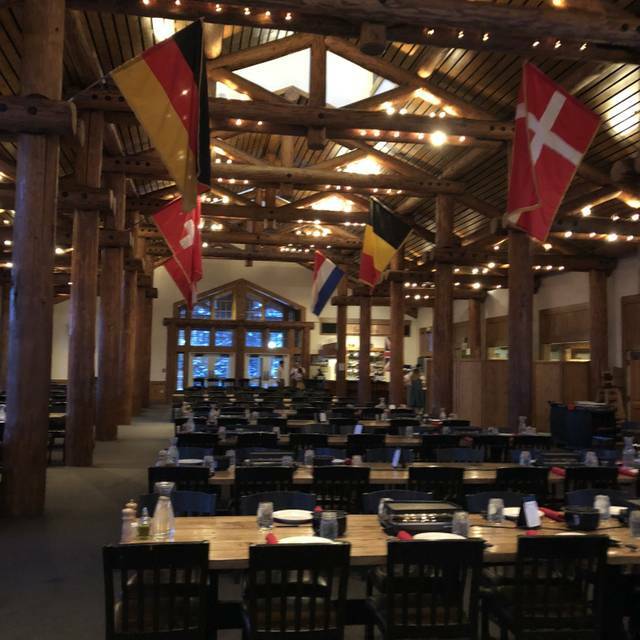 In reality, it’s a repurposed skier’s restaurant with long tables. They repurpose it at night and string power cords and electric plates across the long tables. It’s one open room, and the noise level is high. It was also very expensive for the quality of the food. We still had fun—we always do—and enjoyed going up on the mountain at night. But we won’t do it again. Very expensive small portions and the fondue was just ok. This used to be an amazing place. Now, it’s under staffed, poor quality food, and over priced. Our meal took more than 4 hours. Half of our party feel asleep (kids). The bread to dip in the cheese was stale. The live music was fun. Everything else was a bummer. Super fun place to eat. 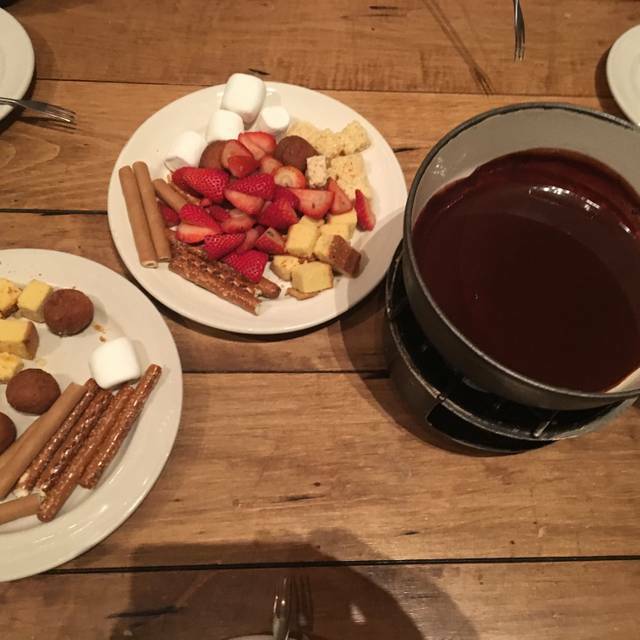 Loved doing the Fondue. The atmosphere was fun and service excellent. The food portions were not fresh, my veggies and bread were cold/dethawing when placed in the table. The meat portion for the fondue was small, with way too many veggies in its place. It’s really expensive for the location, portion size and overall food quality. I would not go back. Totally overpriced for so-so fondue experience. The price was approximately $100 per person without alcohol after price per person, taxes, fees, and tip. Totally not worth it. That is what I would pay for fine dining and this was not even close. Yes, there is a lot of food. That does not mean its good. The service was not great and seemed rushed. And yet, there were tons of people standing around doing virtually nothing expect clearing plates every once in a while and refilling water. Went here years ago and had good memories. It is not the same. Service is not good, food is not good, way way overpriced. I’m happy to pay $100 pp for a great meal and service. This is not it anymore. Very poor service and food compared with any kind of founde restaurant world wide. noisy and expensive! Not worth at all!!! Pros: top of mountain atmosphere, live musicians playing requests, cozy fire, timers for cooking food. service was below average although we had three wait staff assigned to our party, they weren’t around much. They did accommodate any requests we had but we waited 30 min after seated to get our first course, a salad. And we waited for them to come around pretty much all night. Food was average, and for the price...below average. Melting Pot chain fondue restaurants do it way better, way more food for less money. The amount of cheese and broth in our caldron was skimpy. Couldn’t even submerge our meat in the broth. And didn’t have enough cheese to finish our dippers. We have eaten at Fondue Chessel numerous times... though they have change some things a bit, the experience was still a great one. What a rip-off! More than $400 for 4 people. The food portions have gotten sooo small and now the meat is boiled in the pot rather than grilled like it used to be. The food we got was tasty but just not much to it. And where have the flags gone from around the world? The room used to have such an international feel to it. Now it’s bland and boring. And now they’ve even gone to having a Bluegrass Trio instead of the traditional alpine Swiss trio. I’ll never return! There were 8 of us! Most of us ordered Tier 3 at $85. 2 of us asked for only lobster and steak. He said there would be a slight upcharge. It was $18.00. So for approx 3 oz of lobster and maybe 3-4 oz of steak, it was $103. there was of course the veggies, the appetizer plate( a martini onion, piece of cheese, cold small potato chunk and a baby dill pickle) then the dessert, a few thinly wedged strawberries, a couple chunks of pineapple, marshmallows and a few small bite size pieces of cheesecake and the same of pound cake to dip in chocolate fondue. We had drinks and the bill came I asked if tip was included he said no, I didn’t check. He lied!!! Our bill with their tip of $173.45, a Keystone surcharge of $73.28 n of course taxes was $1173.91. I tipped 20% on top of that so $234.00 tip. The total was over $1400. I know people will say you should have checked BUT they were hurrying us to catch one of the last gondolas down and I felt rushed in fact we were starting out when he met us at the last table before the door w the bill. Please don’t judge because I trusted the man!!! Very disappointed in the service as well. Our table was never cleared completely between services. We had to pile dishes. I will never go back and will never suggest it to anyone. I hope the waiter enjoys the $400 plus tip!!!! I’ve owned restaurants/lounges and always told my servers tell people the tip is included. Deception is not the way to go!! Fun special occasion date! Make sure to dress warm for both the ride up and back as well as during dinner as it tends to be drafty. The food is amazing, only complaint is the water tasted very strong of minerals. Had a bad waitress who never checked in our large group. Over priced and food quality is poor.